Transformer on this article modified to become an electromagnet that can lift 11 kg bucket of water, that is about equal to 24.25 pounds (lbs). And it still capable to lift heavier load, but I do not want to push it too hard. 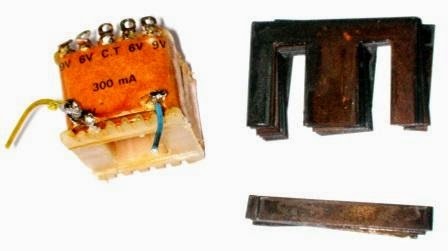 Cheap electromagnet with fluorescent lamp ballast, read here. Transformer that I use is a 12 volt 300 mA with a center tap (CT). Once the outer cover plate is removed, the iron core will be visible. A transformer core consists of strip iron plates shaped like 'I' letter, and iron plates shaped like 'E' letter. Remove the iron plates one by one. At first it is rather difficult because of the iron plates glued with some sort of varnish or resin. Maybe you need to cut some plates with cutting pliers that usually used to cut the pin of electronic component. After 3-4 plates have been cut and pulled out, it will be easier to pull out other plates because there is a space a screwdriver to pry. Then all 'E' metal plates are put back, so that transformer core will be seen as the photos below. An iron rod will be attached to the bottom of transformer. When transformer is connected to power source, 'E' iron plates core will contain magnetic force to attract iron rod. The iron rod will replace the function of 'I' iron plates which has been removed. Keep in mind that iron is more easily become ​​magnet than steel. Electromagnet with iron core has stronger magnetic force then with steel core. But iron is more easily corroded than steel, this is one reason why transformer iron core is coated anti corrosion material or immersed in lubricating oil. Iron core is made from many pieces of metal plate, not a lump of solid iron. This is to reduce the effect of Eddy currents in the iron core which will generate heat and reduce efficiency. Eddy currents is the effect of induction, and they are swirling in the iron core. Iron core plates insulated from each other to cut off the Eddy current flow, this is one of the function of resin or varnish that coats iron core plates. In a large electric grid transformer, lubricant also serves to cool the transformer. Not to reduce friction like it is usually in the machine with moving parts. The following video shows the electromagnetic current is lifting 11 kilograms water in the bucket. Note the presence of a clicking sound when touching the iron rod touching electromagnet iron core, indicating strong magnetic attraction to the iron rod. Iron core 'E' plates are tied with two wires connected to a spring scale in order to measure the weight of lifted load. As the load is a bucket of water, the volume of water can be adjusted to obtain the maximum weight that can be lifted by the electromagnet. Transformer is supplied with a voltage of 12 volts direct current (VDC) into both 12 volts taps. The use of direct current (DC) aims for a steady magnetic field, so it has no electromagnetic change to allow a stable pulling to iron rod. As shown in the photo, both 12 volts taps are soldered with yellow and blue wires. Center tap (CT) of the transformer is not used. Transformer can be supplied at high voltage 220 volts taps. But it is rather difficult to get a steady 220 volts direct current. The generated magnetic field will be unstable or vibrating, as the effect of alternating current rectified by diode circuit to become direct current. It can be stabilized by a high voltage condenser, but usually there are still some voltage changes remain. Also the high voltage has a greater risk. So to be safe, I decided to only use low voltage to be supplied to the transformer. The higher the voltage, the greater the current supplied to the transformer, and the stronger the magnetic force. 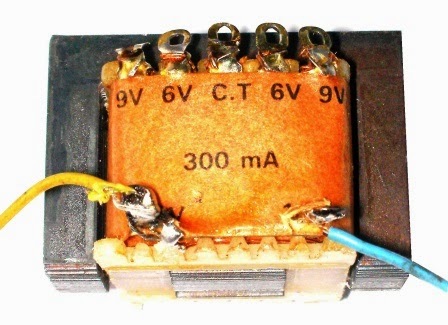 But large current will lead to overheating, transformer could be shorted or even burnt. If those 'I' iron plates are put back, then this electromagnet can be used again as a transformer, so I can still use it for other projects.